Q: Does either lead actor have CF? Isn't this disease appropriation? Why should anyone see this movie? POOL Me In!! Pun Intended! My husband and I saw this last night, we are in our 30's, and both cried like babies all throughout the movie. I didn't even cry this much in the Notebook or PS I Love You or Me before you (and any other sad movie you can think of). I wanted to write a review because I hear a lot of comparisons to The Fault In Our Stars; yes both have sickly teenagers who fall in love but the stories are still completely different. 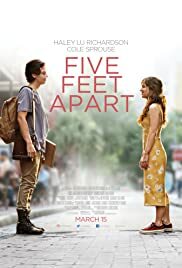 Haley Lu Richardson's acting is amazing and blows it out of the park compared to Shailene Woodley...though not nice to compare as both are great stories in their own unique ways. Her portrayal of Stella was so natural and believable though. The rest of the actors were great too. Take tissues, eat candy, enjoy life and hug your loved ones. Go see this movie!